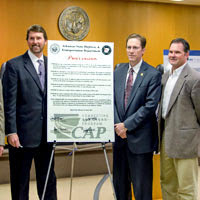 The proclamation was signed by Arkansas State Highway Commission Chairman John Ed Regenold, AHTD Director Scott Bennett, Garver Director of Transportation Jerry Holder, and Jeff Kolb of Kolb Grading. 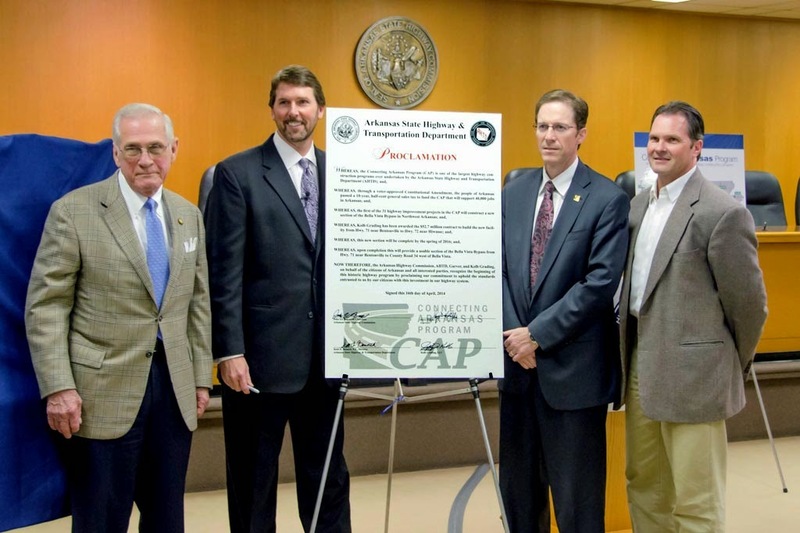 With the first of 31 projects in the Connecting Arkansas Program (CAP) soon to begin construction, the Arkansas State Highway and Transportation Department (AHTD) and the Northwest Arkansas Council hosted a luncheon and kickoff event to celebrate the historic day. Garver is serving as the program manager for the $1.8 billion program, which widens and improves 180 miles of highways and interstates through the 31 projects around the state. The first project to go to construction is the next section of the Bella Vista Bypass in northwest Arkansas. The project extends the bypass approximately 6 miles from Highway 71 in Bentonville to Highway 72. The CAP is one of the largest highway construction programs ever undertaken by AHTD, and it is funded through a voter-approved 10-year, half-cent general sales tax. “It’s a great day for Arkansas, a great day for northwest Arkansas,” said AHTD Director Scott Bennett. You can learn more about Garver’s management of the CAP by visiting the Garver website or the CAP website.